Literary Ramblings and Thoughts, News Worthy, Non-Fiction, Why Not? Manhattan has over eight million people living within its boundaries — the most populous city in the United States. It has always been a place for creative souls and some of those include some of the world’s most prolific and controversial writers. When some of those writers felt a creative urge coming on, they, at times, gave it a little push with a libation. These places still stand and serve as a place to go soak up some of that literary legend energy, along with a nice glass of wine or a smart cocktail. Below are few that are famous writerly hangouts. My husband and I visited this warm and inviting bar/restaurant near the holidays and it was decked out in holiday splendor — lots of tiny, white lights, covering the embossed metal ceiling in the bar section. Brick walls, cozy booths, white tablecloths, subdued lighting and all kinds of tchotchkes and pictures of celebrities decorated the walls, ledges and just about anyplace there was an empty spot. They decorate the pub differently throughout the year, but I can understand why O’Henry chose this spot to write. He allegedly lived just a few steps away and wrote The Gift of the Magi here, one of the best examples of irony ever. We just had a quick snack (fries and they were excellent) at the bar and a couple of glasses of wine, but the atmosphere is wonderful and the service, the same. 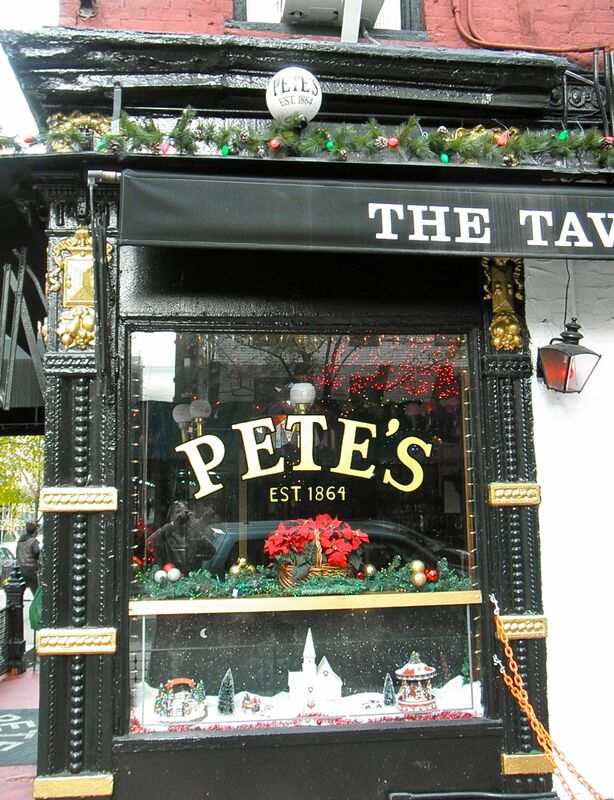 It opened in 1864 and according to their website is the oldest bar in Manhattan. It’s on the Literary Landmarks Register “in recognition of its nurturing atmosphere…” Agree! It got decent reviews on Yelp. Built in 1880, this was a hotspot for numerous creative souls and bohemian types. I’ve not visited this one yet, but intend to soon (it’s on my list that I keep on my board to remind me of all the places I want to go, visit, see, etc.). It reportedly has a Dylan Thomas room where the poet (Do Not Go Gentle Into That Good Night,) allegedly drank eighteen whiskies, then staggered back to the Hotel Chelsea and collapsed. He died a few days later from consuming all that alcohol and other maladies. It was also a hangout for the Beat Generation — Jack Kerouac, Allen Ginsberg and William Burroughs, to name a few. Other literary geniuses that imbibed there: Anais Nin and Norman Mailer. Read visitor/Manhattanite’s reviews here. I’ve written a blog/article or two about this luxury hotel/condo building and walked past it countless times, but I’ve never had a drink/dinner at the Oak Room, high tea at the Palm Count nor danced in its Grand Ballroom. It couldn’t be in a better location — a few steps away from Central Park and very upscale shopping nearby and inside. It was the place to see and be seen during its heyday in the mid-1960s. Truman Capote threw his extravagant Black and White Ball here in 1966 and only invited a lucky few (around 550) and snubbed plenty of major movers and shakers. Capote was the darling of Manhattan socialites and the invitation instructed gents to wear black/black masks and ladies to wear white/white masks. This was the year after his In Cold Blood was released which made him a millionaire and forever changed the way in which writers would approach true-crime stories. Its over one-hundred-year old tradition of catering to the very wealthy still remains — rooms are pricey and condos will set you back at least a million or so. Built in 1907, it’s a National Historic Landmark and certainly worth a visit — at least for an hour or so — on my list to do! 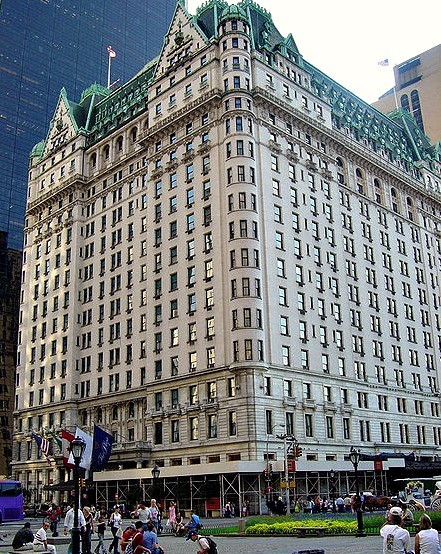 Read reviews of The Plaza here. One worth mentioning but no longer open is Elaine’s (legendary!) which was located on the Upper East Side. We managed to visit this great bar/restaurant a couple of times before it closed in May of last year. 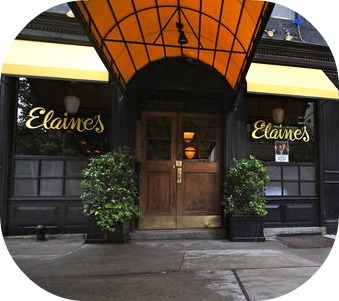 Elaine died five months earlier and with her passing, perhaps the personality of the place just wasn’t what it once was. It was the quintessential New York pub with lots of wood, brick walls, a long bar, a mish-mash of knick-knacks, vintage items, paintings and books, books, books were scattered across its walls and shelves throughout. There was dining in the back and little tables tucked away in corners — some located near the window where you could sit a spell, have a drink and watch passers-by. All sorts of celebrities hung out there as well as writers. Stuart Woods is said to have been a regular (this we learned from the bartender who told us Mr. Woods had a condo in Kips Bay). Reportedly, Elaine gave starving artists (i.e., writers, actors and the like) generous credit privileges when they were down on their luck. The food was nothing to write home about, but you really didn’t go there for the food — more for the camaraderie and great atmosphere. There are numerous places within Manhattan where creative souls have found their muse. As I visit them, I plan to write about them as well. Have you been to any of the above places? What legendary and literary places do you have near you? Love those dark, little taverns, especially down in the village. My parents grew up down there. Hi Susan, I’m a fairly newbie transplant (originally from the South), and also reside on the Island of Long but I’m a short train ride away from Manhattan, so I go in frequently. Love the Village and Soho. Thanks for stopping by to comment/read and hope you’ll get back to the East Coast one of these days if your path brings you here again… :). Please keep in touch, Susan as your trip gets closer and hope you’ll be able to visit your favorite places when you visit. Glad you enjoyed it the post, Brinda and thank you! There is so much in the city to make one feel inspired; now writing about all those inspirations take much more time/creativity than visiting them. :). Hi Sharon, Thanks — to visit an old English pub is on my “to-do” list. New York is a fascinating place; I think it would take years to visit all that’s there, but I’m trying…. :). Thanks for your kind comments and glad you enjoyed the post. Oooh now you have gone and give me very itchy feet….haven’t been since 1987…that’s too long isn’t it? I get into the city whenever I can and make a point to visit some of those places that I’ve always wanted to. It’s never “too long” or too late, don’t you agree? :).